Samsung SilverCare Washer | OhGizmo! Subjecting your clothes every week to hot water and detergents in the washing machine eventually takes its toll. Even after only a few weeks that new shirt starts to look a lot less new. As an alternative you could of course simply never wash your clothes but that creates its own set of problems. Another solution is to invest in a Samsung washing machine with SilverCare technology. Just outside the tub is a grapefruit-sized device that houses two pure silver plates. As cold water is pumped into the washer these plates are electrolyzed creating 100 quadrillion silver ions that are then released into the drum. These silver ions thoroughly penetrate the laundry and Samsung claims they can kill 99.9% of the bacteria in your dirty clothes. The best part is the machine only uses cold water which helps reduce the wear on your clothing and is far more energy-efficient. A Samsung Washer with the SilverCare technology (a 3.8 cubic foot model) will set you back around $1100 which is actually no more expensive than a standard washer. 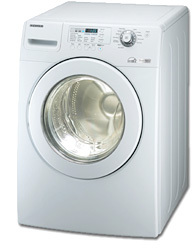 around $1100 which is actually no more expensive than a standard washer. Say what!?!? My local paper has countless ads for washing machines at various national appliance stores for $300! Forthermore, on the subject of washing machines, front loading washing machines have become quite the rage. Promises of reduced water use, reduces electricity use, reduced wear on the clothes and more are used to flog these machines. Well I recently bought one. While it might be true that they use less electricity, and it is true that they put less wear and tear on the clothes, and they definitely use a lot less water, they don’t get the clothes nearly as clean as older washers!!! They require special detergents and because of the weaker detergents and less water, the clothes are not cleaned as well and the washer does not properly rinse the detergent out. These front loaders are a major disappointment! I’m sorry I got oone. I have had my Samsung SilverCare washer for about a year and a half now and have had NOTHING but problems with it, from the first month on. My back is KILLING me due to the fact that I can only do about 3-10 loads before the machine is ‘unbalanced’ and refuses to spin or agitate. I have to spend about 3-8 hours a WEEK moving the washer back and forth (often with a full load, including water,) to adjust the feet on the pedestal in order to get the machine to ‘balance,’ (but of course, if you move the machine back into place, this turns the feet…) and after a few hours of this, much of the time with a level indicating that the machine is perfectly level, it usually seems like dumb luck gets the machine working again… for another three to ten loads, anyhow. Because all washers vibrate during the spin cycle… you guessed it… this gradually turns the feet on the pedestal, so it’s only good for a couple of loads before the machine perceives itself to be unbalanced again and will not work. By the time the muscles in my back, leg, and neck recover from the grueling ordeal of trying to fix the darned thing, it’s back to the ordeal once more. It’s absolutely maddening! I have not caught up on my laundry in six months. In addition to this frustratring backache of a problem, my clothing doesn’t seem to be getting clean at all. Most of my clothing comes out of the wash with grease stains. (I am using HE/2X detergent.) You aren’t really saving much electricity or water if you have to keep washing pre-treated clothes three times before they come clean. Forget bleaching… Clothes do not bleach evenly, there isn’t enough water for them to soak in. I have to bleach my clothes in a sink and then wash them. I am sure my tombstone will read “Death by Beeping”… I am even hearing the darned error message beep in my sleep now. I’ve seen similar complaints at epinions.com regarding clothes not coming clean, the mildew issue, the ground fault/wiring issues, and constant error messages. Samsung has a new model out with auto-balance, and I hope that that model worked the kinks out. Samsung service is non-existent, so I am stuck with this piece of crap, and it’s not even paid off yet. Next time, I am getting a top loader- less headache, easier to fix and replace parts for, and my clothes will get clean. That washer looks really great. For me $1100 is quite expensive.